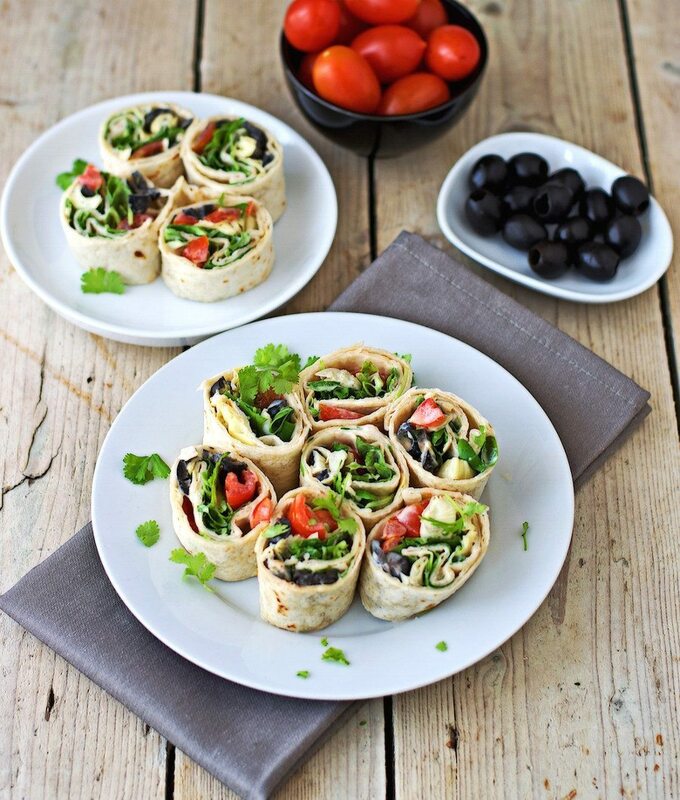 These Mediterranean Pinwheels are a super easy and ultimately delicious snack and party food. Made with tomatoes, artichokes, and olives, they get their awesome flavor kick by the homemade Tahini sauce. All vegan and gluten free. Friends, I’m still here! Yeah, I managed to get through the move in one piece. I’m right now sitting in a furnished apartment that will be my home for – hopefully – two months until the permanent home that is still under construction is finished. Keep your fingers crossed that there will be no delays! The place itself is quite ok – a bit small but bright and at a quiet street. The atmosphere is pretty relaxed and the people seem friendly so far. It’s a good start. 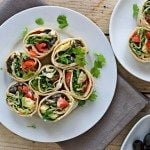 Anyways, in spite of this little drama, I still made a quick recipe for you – even before unpacking all my things that didn’t go into storage: Mediterranean Pinwheels. I just made a quick visit to the nearest supermarket (which had a surprisingly good selection, need to explore it more) and bought some cherry tomatoes, olives, artichokes, and lettuce. Some tahini as well as tortillas. First, I whisked together a tahini sauce (yeah, you know I LOVE it) with some white vinegar and lemon juice. Adding some water to make it smoother, and garlic, salt, and pepper for taste – done. That’s all one needs to prepare for the pinwheels, except for cutting the vegetables. I spread a spoonful of the tahini sauce on one tortilla, distributed the veggies and a handful of lettuce on top. 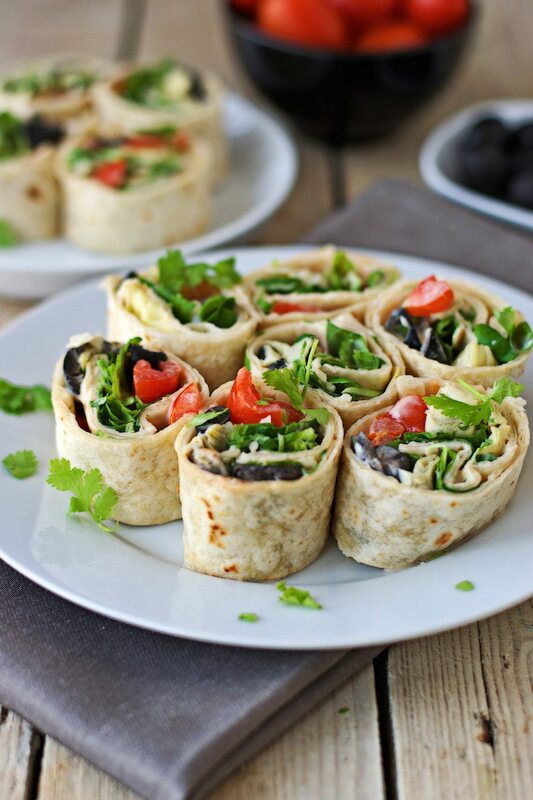 Rolling it tightly and cutting the roll into slices finishes the Mediterranean Pinwheels. If you give the Mediterranean Pinwheels a try tag me on Instagram and Facebook, show me your remakes with a picture. See you around, Florian. Whisk together all ingredients in a small bowl until the sauce is creamy. Cut the tomatoes, artichokes, and olives into slices. Spread about one Tbs of the Tahini sauce on one tortilla. Add the vegetables and top with a handful of salad. Tightly roll the tortillas and cut into pinwheels. Gorgeous as always!! I’ve never made pinwheels before but this sounds amazing. How’s the new place coming along? All the best with adjusting I’m sure it’s going to be amazing! Excited about my own move next month! Thanks, Felicia. Everything is good now. Settled well into the temporary place and I do quite like it. Let’s see if the next step also goes to plan. How are your plans? Everything good to go? Haha, great to know that you quite like your new temporary place!! As for myself, I still haven’t even begun packing. Also need to get plane tickets. lots of things to do still! I will likely make these today – yay! Love the sauce, especially! Happy for your move! Let me know how they work for you! Fingers crossed for smooth sailing! These remind me of childhood when my mom would make me wraps to bring to school lunch! Thumbs up to your Mom, Rebecca! Hope you get to get settled soon in your permanent place. These look wonderful, pinwheels are a favorite entertaining dish. It needed to be without the oven. I didn’t figure out until today how this microwave-oven combination works, haha. These are gorgeous! Fingers crossed for no delays on your new home! Thanks, Des. I’m sure it will help! That would be an awesome picnic. I really love the idea that you use tahini as well. I’ve got to try! Thanks Del! Let me know how they work for you. What a perfect lunch! Hope you get settled in soon, moving is the worst! It’s going alright, Lauren! Settled in quickly, warm water is running. And with a pinwheel lunch, it’s always good. This looks like a wonderful, fresh summer dinner! Love it. Good luck with your house. These pinwheels look so delicious. I am always looking for a good post-workout recipe. Thank you so much. I think those pinwheels will be amazing after workout! Omg these look so gorgeous Florian!! Loving that gorgeous overhead shot! So excited for you…you are building a house? How cool! Hope the warm water gets up running soon though, yikes! Such a beautiful recipe and Love how easy it is. 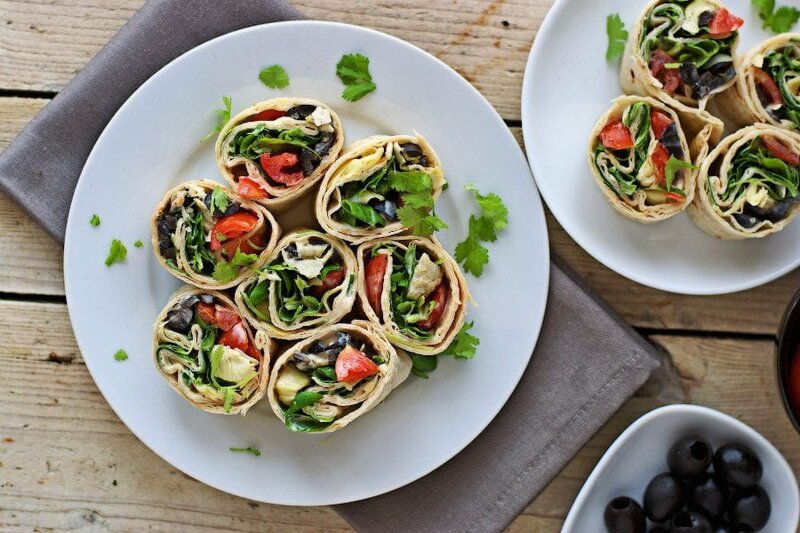 Olives are one of my favorite food, so I especially love that you added them! Hi Angela! I used Kalamata olives and artichoke hearts plain! Hi Amber! Every tahini is different in texture! So please make sure to use less water, vinegar and lemon juice. Hope that helps!